Today Tanki X got a small but rather nice update. We added a new opportunity to connect to a custom battle through a special Battle code. It allows you to invite any players to the created battle, even if they are not on your friends list. If you have the Battle code from another player, just click the button “Enter with the battle code”, enter the code and join the battle. Customize the battle as needed, then click the button “Open the battle”. It will cost you 1000 blue crystals. Please note that at the moment there is no additional confirmation window in the game about spending crystals to open the battle! It will be added later. You will see the Battle code as a set of numbers. Share this code, for example, in a general chat, in a discord or another social media. The Battle code can be seenonly by the creator of the battle (or another player with a crown, if there was a transfer of leadership), other players in the lobby won’t be able to see the code. We added an additional parameter in the settings of custom battles — a limit of players. You can adjust the number of players only when creating a battle. If you want to edit the number of players, you should recreate the battle. 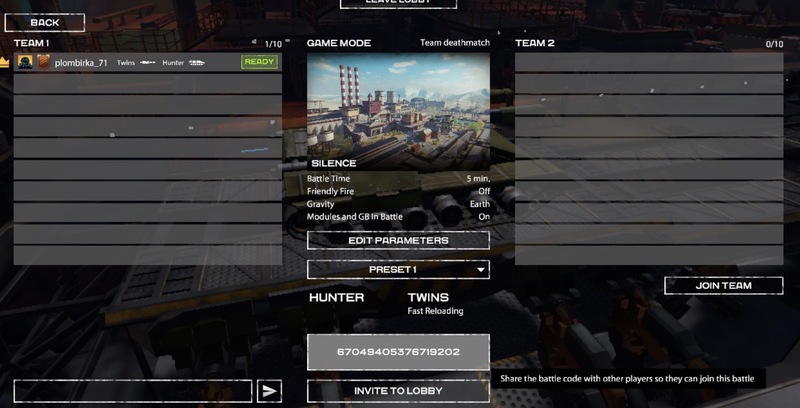 Only the creator of the battle can invite players to the custom battle now (players among friends list via the button “Invite to lobby” or via the Battle code). Participants of the battle can not invite other players. But the rights of the creator (crown) are also transferred to a random player if the creator left the game. Also we made some changes in the balance of weapons. “Explosive mass” — reduced cooldown, now at level 10 time is 258 seconds instead of 270 previously. “Mine” is now at the same time in a battle can exist 4 mines, was previously a limit of 2. Start mining the flag. “Freeze” — increased damage at maximum range of attack from 360 to 395. “Ricochet” — reduced recoil when shooting. “Shaft” — reduced arcade damage from 400 to 360, increased sniper damage from 1080 to 1188. “Twins” — increased damage from 80 to 88, increased projectile speed from 90 to 130. “Hammer” — slightly increased spread, increased impulse from hitting the whole shot from 11 to 12.6. “Vulcan” — increased damage from 400 to 440. There is an increased time for spinning barrels from 1 to 2.5 seconds. The time to overheat was increased from 4 to 5 seconds. We added death zones on the “roofs” on the map Repin. We fixed a bug with the “Shaft”, when it could not shoot through different grids in a sniper mode. We fixed several bugs that caused the client crashing. Tanki X return to Mac OS!